Milk, milk, lemonade… around the corner, justice is made. Filmmakers Peter Maldonado and Sam Ecklund point their investigative lens at St. Bernardine, a private high school recently terrorized by a vandal known only as The Turd Burglar. Kevin McClain, a junior, has been expelled and awaits trial for the crimes. But is justice being served? Is the system rigged against the disenfranchised? And who is The Turd Burglar? 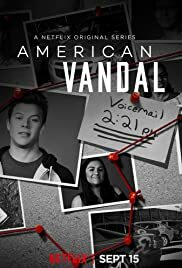 From creators Tony Yacenda and Dan Perrault, and showrunner Dan Lagana, comes the second season of the Emmy-nominated satirical true crime series, American Vandal.